It's been a gray work week with the storms and rain, but the start of the weekend will actually be pretty nice! Partly cloudy skies and temperatures in the low 80°s are expected for tomorrow, but it'll feel a little humid as dew point temperatures will be in the mid 60°s. A cold front is beginning to move into the Stateline, and will progress slowly through our area during the rest of the day. This is because there's an upper level trough digging to the south, which will slow the movement of the low pressure system and the cold front. This will keep our thunderstorm/rain chance with us between now and this evening. Stronger storms will stick down to the south in central Illinois, where the front will be stronger. However, there is a slight chance for some hail in our southern counties: southern portion of Dekalb county, Lee county, and Whiteside counties. Other than that, only heavy rain is expected from these storms. That cold front will move out around 10pm, where a high pressure system will move in from the west to give us clear skies for the overnight. That high will stick around for Saturday, giving us a break from the storms and rain. Another low will form west of us on Sunday, pulling in more warmth and moisture, which will bring back our storm chance. That low will linger through most of next week due to an upper level low being cut off from the jet stream. This will keep our storm chance for most of next week, and unfortunately the Fourth of July is included in this. 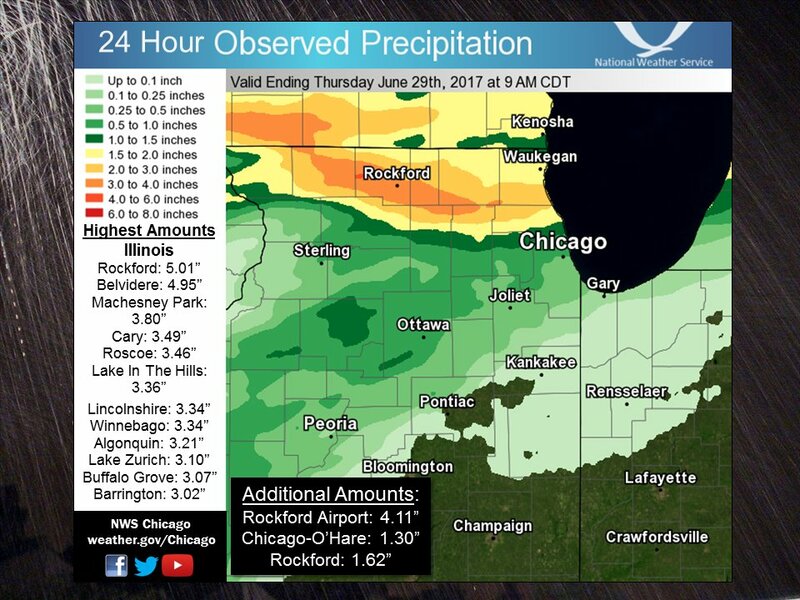 Impressive rainfall totals from Wednesday evening with many residents reporting anywhere from two, up to six inches of rain! Flash flooding quickly took place in Stephenson, Winnebago and Boone counties. Even northern DeKalb county had significant flooding in farm fields and ditches. 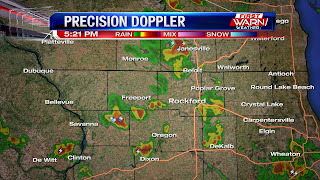 There was a round of non-severe showers and thunderstorms that moved through northern Illinois earlier Thursday evening, but the radar is fairly quiet now. Showers and thunderstorms back west over north-central Iowa need to be monitored for any continued movement east tonight. 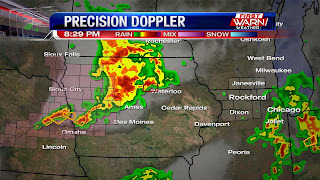 Severe weather has been occurring with these storms, but they should begin to weaken as they move further into Iowa before eventually getting into northwest Illinois. If this cluster of storms were to hold together they would arrive after Midnight. The flooding rain from Wednesday has caused local rivers and creeks to either reach flood stage or spill out of their banks. 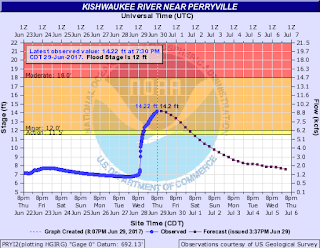 Both the Kishwaukee and Rock Rivers have either a Flood Advisory or Flood Warning for them through the end of the week. 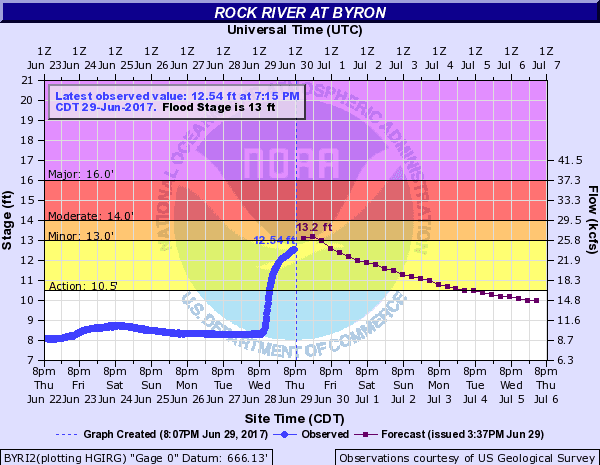 The Rock River in Byron has come very close to flood stage with a current river level of 12.54 feet. Minor flood stage is 13 feet. 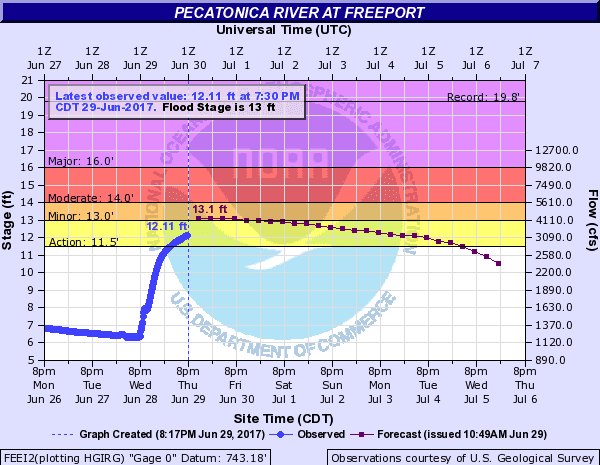 Current forecasts have the river cresting just a little over 13 feet by Friday morning before heading back down by the weekend. 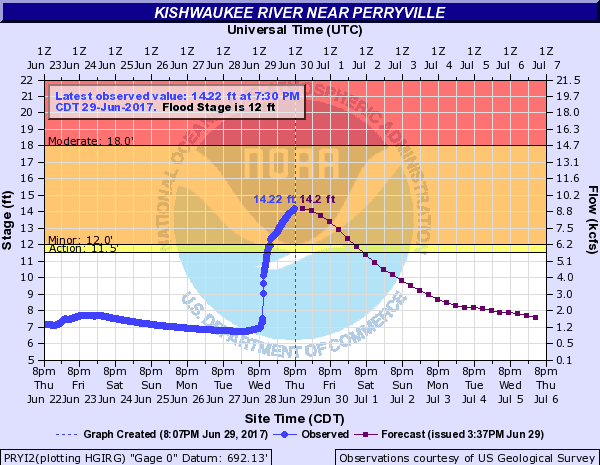 The Kishwaukee River has reached minor flood stage, but is expected to recede heading into Friday - pending any additional rainfall. 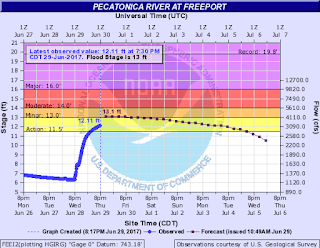 The Pecatonica River in Freeport is also expected to crest at minor flood stage either late tonight or Friday morning, before receding into early next week. 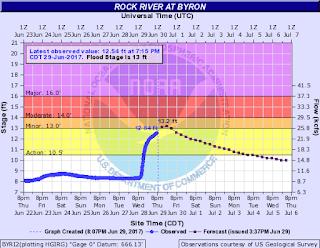 Click here to monitor current river levels heading into the weekend. In all there were four confirmed tornadoes that touched down in the Stateline Wednesday evening. 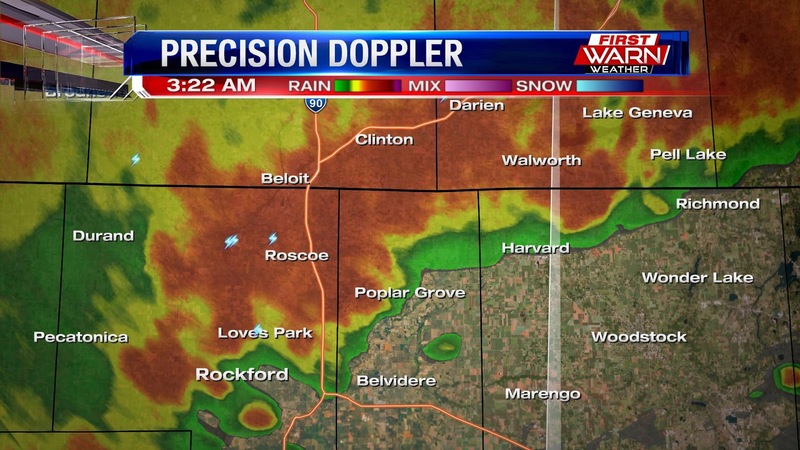 Two in Green County and two in Winnebago and Boone counties. The first tornado to affect northern Illinois occurred around 8:15pm, touching down two miles southeast of Cherry Valley near the intersection of Burton and River roads. This EF 1 tornado was on the ground for six miles before lifting south of Belvidere. Maximum sustained winds were around 100 mph. It lifted at 8:22pm. The second tornado quickly formed after the first near the intersection of Genoa and Huber Roads around 8:23pm- directly impacting a farmstead just west of the intersection. This EF 1 tornado was on the ground for 1.6 miles and had maximum sustained winds of 100 mph as well. It lifted around 8:25pm. Two other tornadoes occurred in Green County Wednesday evening south of the town of Monticello. These, too, were rated EF 1 tornadoes with maximum wind speeds of 100 to 105 mph. The first tornado occurred near Faith Engineering, damaging two buildings. A trailer was flipped and multiple trees were either snapped or uprooted. A dumpster was also blown across Highway 69. Maximum wind speeds with this tornado were estimated at 100 mph. It was on the ground for only half a mile and was 150 yards wide. The second tornado occurred roughly five miles south of Monticello, beginning at the intersection of Highway 69 and Cold Springs Road. It was on the ground a little over two miles before lifting near the intersection of Sulzer and Feld Roads. A barn and pole shed were destroyed, four houses sustained damage and four power poles were either snapped or uprooted. This was also rated an EF 1 tornado with maximum sustained winds of 105 mph. We had a nice start to our Thursday with the clouds breaking up and allowing for sunshine. This was a great relief after what we had last night. Thunderstorms are expected to return between 1-4pm, as we are under a Slight Risk for severe weather. Hail is expected with some of these storms, but only up to quarter-sized. We can't rule out a few strong wind gusts, which would top out at 40 mph. The storms are expected to die down around 10pm, with rain lingering afterwards. A low pressure system off to the southwest will make its approach and bring in warmth and moisture, allowing for thunderstorms to have plenty of fuel. Dew points are expected to be in the mid 60°s to low 70°s, with any dew point temperature in that range capable to producing tall thunderstorms. Because of their height, that brings the possibility for some hail. This low will bring thunderstorms for the afternoon on Friday as well, but these will only be isolated and aren't expected to be severe. The low moves out Saturday, where we'll get a break from the storms with partly cloudy skies and temperatures in the low 80°s. However, another low will move in Sunday and bring some isolated storms during the evening. Afterwards we'll have a string of days consisting of isolated thunderstorms, and unfortunately the Fourth of July is included in that. 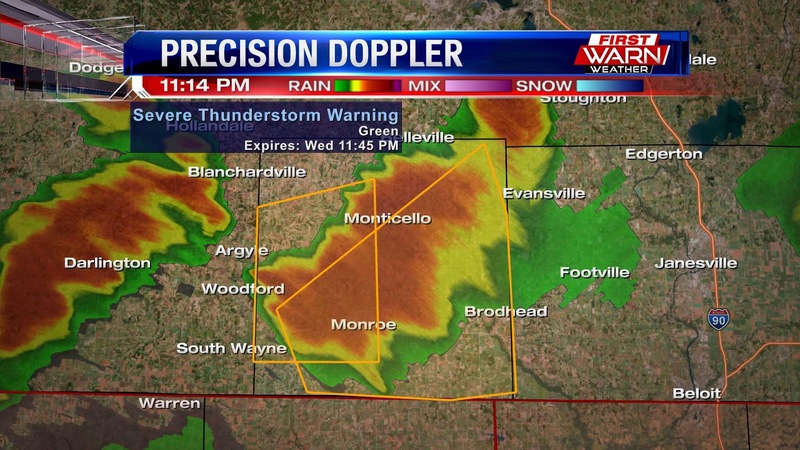 11:15pm Update: New Severe Thunderstorm Warning for Green County until 11:45pm. 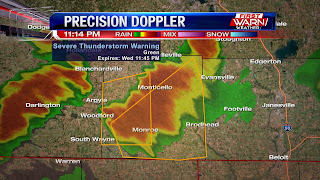 Storm located near Monroe is capable of producing wind gusts close to 60 mph and quarter sized hail. 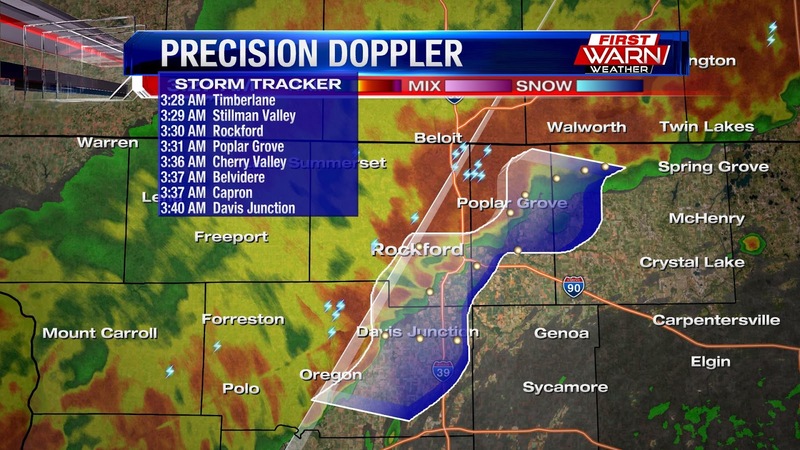 This storm is moving east at 40 mph. 11:00pm Update: Severe weather threat has ended for most of the Stateline, however, isolated severe thunderstorms will continue into the night. Right now a Severe Thunderstorm Warning has been issued for Green County until 11:15pm. 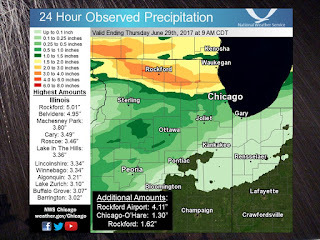 Extremely heavy rainfall occurred over far northern Illinois Wednesday evening with radar estimates of three to six inches of rain. Because of that a Flash Flood Warning has been issued for Jo Daviess, Stephenson, Winnebago, Boone and McHenry counties until 2:30am. A Flash Flood Emergency has been issued for Winnebago and Boone counties. We've received numerous reports of cars stalled trying to drive through flooded roadways. NEVER EVER try to drive through a flooded roadway. Most storm fatalities that occur are due to flash flooding. Storms have been ending, but the flooding threat will continue into the night. (11:17:51 PM) nwsbot: Local Storm Report by NWS LOT: Rockford [Winnebago Co, IL] official nws obs reports HEAVY RAIN of M4.11 INCH at 11:00 PM CDT -- daily total as of 11pm. 3.39 inches in the past 3 hours. international golf course. 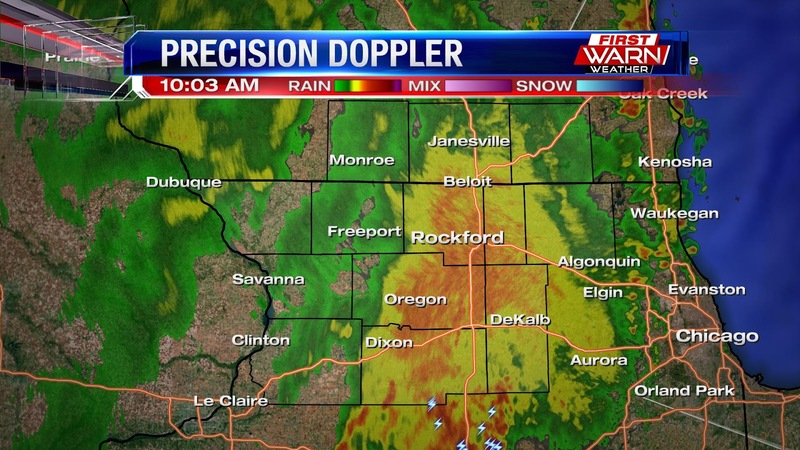 3.48 inches measured in downtown rockford. report from social media. (10:38:37 PM) nwsbot: Local Storm Report by NWS LOT: Loves Park [Winnebago Co, IL] public reports HEAVY RAIN of M5.69 INCH at 10:00 PM CDT -- report from social media. (10:38:38 PM) nwsbot: Local Storm Report by NWS LOT: Winnebago [Winnebago Co, IL] public reports HEAVY RAIN of M5.21 INCH at 10:00 PM CDT -- report from social media. (10:09:48 PM) nwsbot: Local Storm Report by NWS LOT: Pecatonica [Winnebago Co, IL] trained spotter reports HEAVY RAIN of M5.00 INCH at 10:08 PM CDT -- storm total so far. ditches on full. 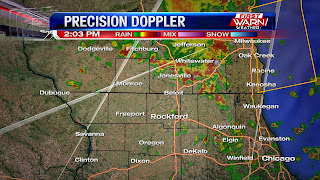 (10:01:31 PM) nwsbot: Local Storm Report by NWS LOT: Rockford [Winnebago Co, IL] official nws obs reports HEAVY RAIN of M2.37 INCH at 10:00 PM CDT -- 2 hour amount and still raining. 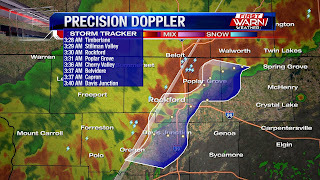 (10:55:18 PM) nwsbot: Local Storm Report by NWS DVN: Stockton [Jo Daviess Co, IL] law enforcement reports TSTM WND DMG at 07:38 PM CDT -- tree branches and power poles down. (10:57:00 PM) nwsbot: Local Storm Report by NWS DVN: Elizabeth [Jo Daviess Co, IL] law enforcement reports TSTM WND DMG at 09:03 PM CDT -- tree branches down. (10:47:01 PM) nwsbot: Local Storm Report by NWS DVN: 1 NE Winslow [Stephenson Co, IL] law enforcement reports FLASH FLOOD at 10:13 PM CDT -- portion of mann rd washed out. (10:52:29 PM) nwsbot: Local Storm Report by NWS DVN: Rock City [Stephenson Co, IL] law enforcement reports FLASH FLOOD at 10:13 PM CDT -- water rescue of person in flood waters. 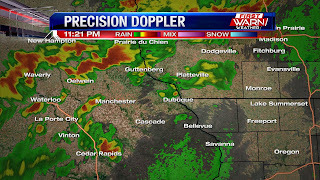 A Tornado Watch has been issued for Green, Rock and Walworth counties in southern Wisconsin and for Stephenson, Jo Daviess and Carroll counties until 10pm Wednesday evening. Severe thunderstorms have really developed over the past couple of hours over north-central and central Iowa following thunderstorms from Wednesday morning. Instability is beginning to build back up over Wisconsin and northwest Illinois due to a few breaks in the cloud cover earlier this afternoon. A warm front has pulled north of the state line this afternoon which will cause current storms moving into southwest Wisconsin to have the potential to rotate as they move near the warm front. 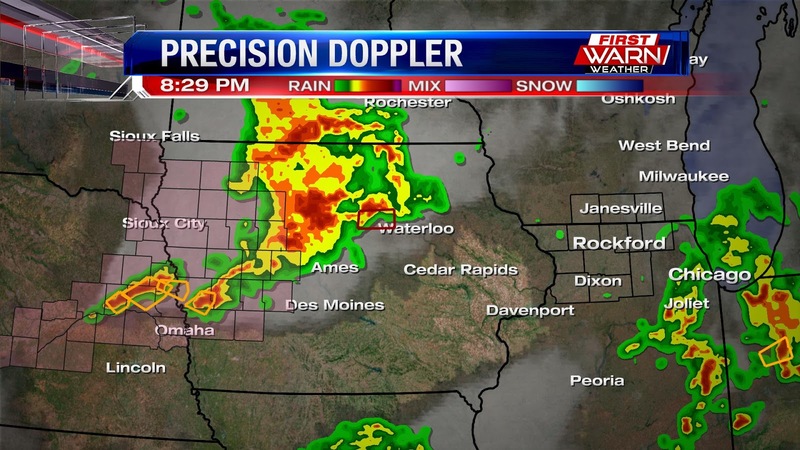 A line of thunderstorms have developed back further southwest from near Waterloo, IA to southwest of Des Moines. There, numerous severe thunderstorm warnings and tornado warnings have been issued. 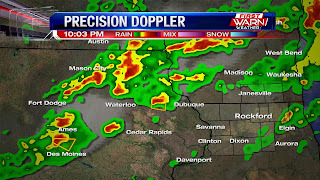 Storms have also developed near Dubuque, IA and will lift northeast into southwest Wisconsin and northwest Illinois through 7pm this evening. As we get closer to 8pm this evening, storms out west will likely begin to form into a line or cluster - posing more of a wind threat into the early night. Time line for thunderstorms appears to be roughly from now through roughly 7pm for storms affecting northwest Illinois - west of line from Madison down through the Quad Cities. Storm threat then will increase for north-central Illinois closer to 8pm/9pm. 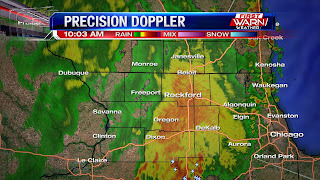 Moderate rain continues over north central Illinois, as a MCS from Iowa pushed east into the Stateline. There isn't much thunder or lightning left, as the thunderstorm complex ran into slightly more stable air. Rain will continue through about 11am or so this morning and then there will be several hours of dry time, and even potentially some clearing of the cloud cover. If we do get some sunshine, we need to keep an eye on storm development in the early evening. Right now there are several parameters that are coming together that could bring strong to severe storms this evening. Right now there is an enhanced risk for severe storms over Iowa and northwest Illinois. The rest of the Stateline is under a slight risk. The higher threat for super cell type storms will mainly be in Iowa, which brings the threat for all types of severe weather. 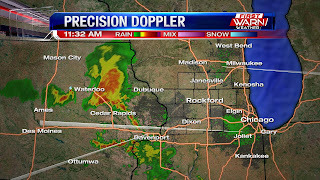 By the time the storms make it to the Stateline, the look to form into a line of storms. 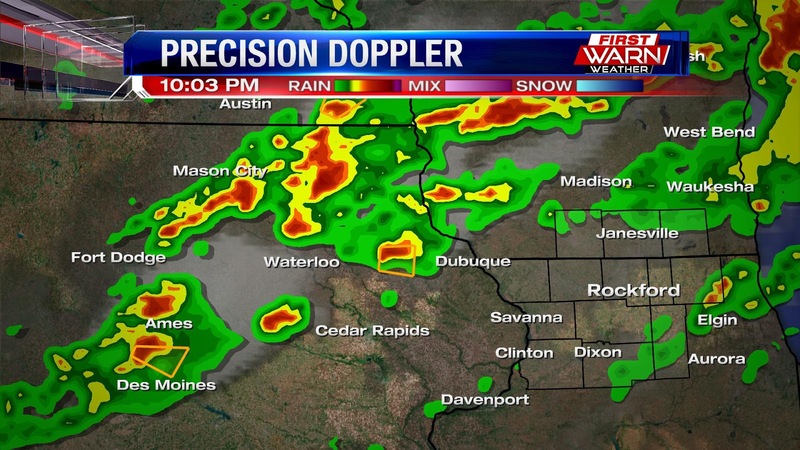 This would bring mainly a heavy rain and strong wind threat to the Stateline this evening. Make sure to stay weather aware this evening, and we will make sure to keep you posted as storms develop in Iowa this afternoon. Many may be spending time outdoors this holiday weekend as we get ready to celebrate the 4th of July. And for most, the weekend isn't looking all that terrible. We should be done with the heavy rainfall from the days prior and temperatures should be fairly comfortable in the upper 70's and low 80's. On Saturday a cold front will move in from the north and could trigger an isolated shower or thunderstorm during the afternoon and early evening. The same may occur for Sunday, but high pressure at the surface may be able to overcome any rain trying to form. So for both Saturday and Sunday I put the percentage for rain at twenty percent. Pattern then turns a little more active for the beginning of next week with another low pressure system gradually moving in from the southwest. Forecast models differ just a little on where exactly this low will travel and how far north it will move. But it looks like rain/storms are possible Monday, but should be shifting southward for the fourth. Following a beautiful Tuesday afternoon, the weather turns a little more active Wednesday through Friday. High pressure slides to the southeast late Tuesday night and Wednesday morning, allowing a warm front to inch closer to the Great Lakes. Thunderstorms - some severe - have developed over the western Plains and will remain well west during the overnight Tuesday. By Wednesday morning, a complex of thunderstorms is expected to develop and move into eastern Iowa, southern Wisconsin and northern Illinois shortly after sunrise. These storms are not expected to be severe, but could have a little more steady rainfall with them. An abundance of cloud cover will likely hold temperatures just below 80 degrees, but dew point temperatures will be on the rise reaching the mid 60's by Wednesday evening. The rise in dew point signals an increase in moisture in the atmosphere and this could lead to the potential for heavy rainfall through the end of the week. Right now it looks like there are two potential periods for heavy rain. The first arriving Wednesday evening/night and the second late Thursday through Friday morning. Rainfall amounts anywhere from one to three inches of rain will be possible over a three day span. Highest rain totals may be centered more over west-central Illinois, southeast Iowa and northern Missouri. Because of the strong winds that will be taking place a few thousand feet above the surface of the earth, thunderstorms late Wednesday do have the potential to produce gusty winds with them. This threat would likely be during the afternoon Wednesday and Wednesday night. Stronger thunderstorms are also possible Thursday - right now mostly for our southern counties of Whiteside, Lee and DeKalb. In the previous post you read about the potential for heavy rain to occur on Wednesday, but some signs are coming together that are pointing to the threat for strong to severe storms in the afternoon. An incoming warm front will lift north into the Midwest and bring with it a warmer and unstable air mass. Dew points will rise into the mid and upper 60s across northern Illinois, while dew points west make it into the upper 60's and low 70's. There are a lot of variables though that will come into play that will effect what type of storm coverage we'll have. The timing of the 'mini-low' in conjunction with the warm front, along with outflow boundaries(mini cool fronts) from previous storms will with both have an effect on where storms develop through the afternoon. If strong storms do develop, the primary threats would be strong straight line winds and hail, though an isolated tornado can't be ruled out in Iowa or southwest Wisconsin. Another round of storms with heavy rain is looking more likely again on Friday, along with the potential for strong storms too. Thursday will be relatively dry, but more humid and warmer! We'll continue to keep an eye on this system, but until then go out and enjoy the beauty two days we have on tap! We had quite the summer chill this past weekend with temperatures only in the mid to upper 60's and low 70's for highs Saturday and Sunday. The start of the week will almost be a repeat of Sunday's weather - partly sunny skies, highs near 70 degrees and a chance for an isolated storm or two during the afternoon. Tuesday is looking great, just a little below average with temperatures in the middle to upper 70's. Winds then begin to shift around to the southwest Tuesday night and Wednesday following the passage of a warm front. This will allow dew point temperatures to rise into the low to mid 60's beginning Wednesday afternoon and evening. The warm front will then stall either just north or very close to the Stateline through the end of the week. With the continuous pull of moisture from the south during this time, periods of heavier rain could occur until the front passes over the weekend. Rainfall totals ranging anywhere from one to three inches could be possible. That occluded low to the northeast has lingered, and since the jet stream is nearby it allowed for a trough to develop to the northwest of us. Thunderstorms and showers have developed along the trough, and is tracking in our direction. The storms aren't severe, but they may produce some gusty winds. Luckily the storms have been dying down, but the rain has remained. 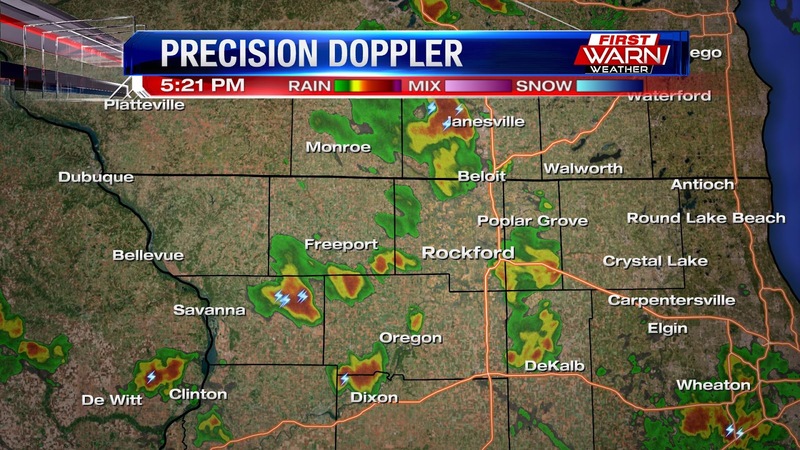 Even though the storms are dying down, we may still hear a few rumbles of thunder along the stateline while the storms continue to die down. 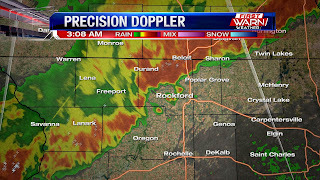 The line will mainly move through our northern counties: Green, Rock, and Walworth. 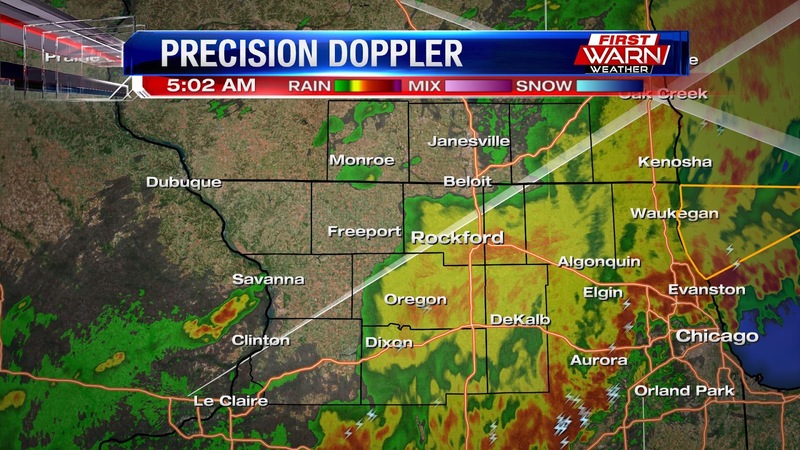 However, we can't rule the line dipping down into the counties just south of the Stateline quite yet. The trough will move out a little after 10pm, where we'll stay mostly clear afterwards. Once that high pressure system to the northwest tracks closer, which will happen tomorrow night, it'll push that low to the east and keep pop-up showers and storms away from our area. We'll see cloudy skies on Sunday and Monday, but more sunshine is expected on Tuesday when that high moves directly over our area. Another low moves in on Wednesday, which will bring back warmer temperatures and thunderstorms. We'll warm back up into the 80°s by the end of the week, but thunderstorms will stay with us from Wednesday to Friday. However, the storms are expected to clear out for next Saturday. We had a bit of a rough start this morning with the thunderstorms moving through, but since then the weather has stayed fairly nice! That low pressure system that brought us the thunderstorms has been pulling northerly air into our area. It hasn't done much to our temperatures yet, but it has lowered our humidity quite a bit and has also been clearing the skies. The skies will continue clearing during the evening, where temperatures will be in the 70°s. That northerly air will start to impact our temperatures after sunset, cooling us down into the mid 50°s during the overnight tonight. A high pressure system will move in from the west tomorrow morning, and will continue that inflow of northerly air into our area. This will shift the jet stream south of our area, which means we'll see cooler and drier weather, while everyone that's south of the jet stream continues to see the heat and humidity that we've dealt with the past couple of weeks. Even though our temperatures will be cooler, and it may not necessarily be summertime pool weather, our humidity values will stay low and we'll get to enjoy plenty of sunshine. The cool inflow will end on Wednesday when that high pressure system tracks east and another low moves in. This will bring back the warmth and humidity, but it'll also increase our storm chances. A cold front will move through late Wednesday night, keeping thunderstorms with us during the overnight. We'll see some lingering rain on Thursday before the storms return on Friday, where another cold front will move through. Temperatures are expected to warm back up into the low 80°s by the end of next week. You might have woken up to the thunderstorms overnight, but as we look into the weekend it will feature fairly dry and comfortable conditions. Today will still be warm with highs near 80°, despite the cold front south of the area. The cooler air will lag, which it typically does with summer time fronts, but arrives tomorrow bringing high temperatures into the low 70's and upper 60's through the weekend. Drier air will advect in behind the front, so humidity will drop quite a bit through the weekend and into next week. Overall you can expect a dry weekend, but there are a few spotty rain chances through Sunday. An upper level trough will dig in over the Midwest and Great Lakes, and will tug with it cooler air. But, there will also be a few disturbances that ride along the trough that could squeeze out what little moisture we'll have overhead. Both this evening and Saturday evening feature isolated shower chances. A strong wave passes through Sunday and this will bring slightly higher chances for showers, and maybe even a rumble of thunder Sunday evening. Right now, that chance is still relatively low, but we'll keep you posted if that changes in forecast updates! 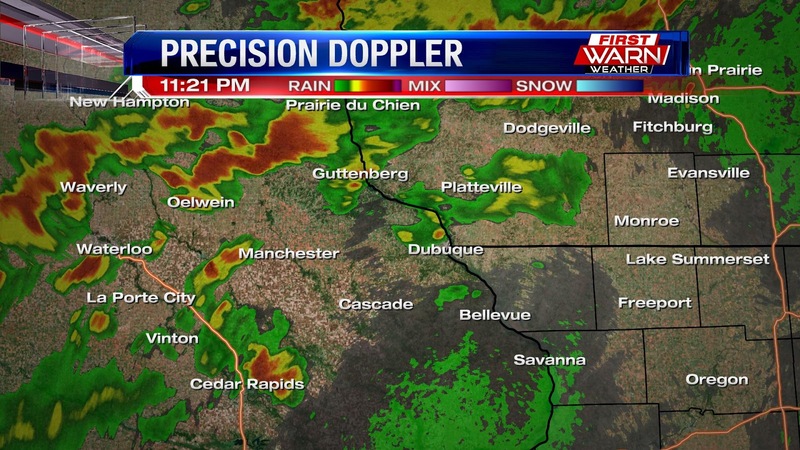 Line of strong storms from near Capron to Oregon - moving SE at 25 mph. Heavy rain and wind gusts up to 50 mph. 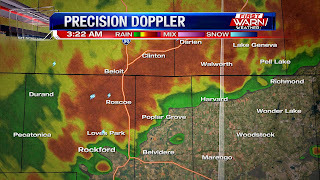 Heavy rain and lightning over Roscoe. 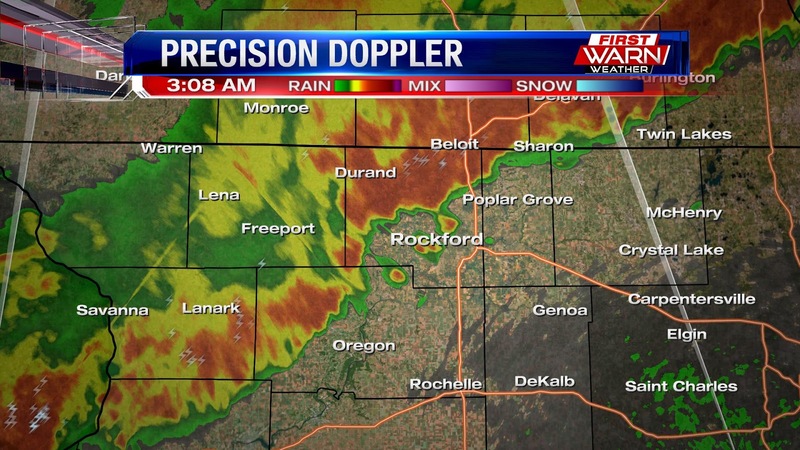 Heavy rain and strong gusty winds moving into west Rockford. 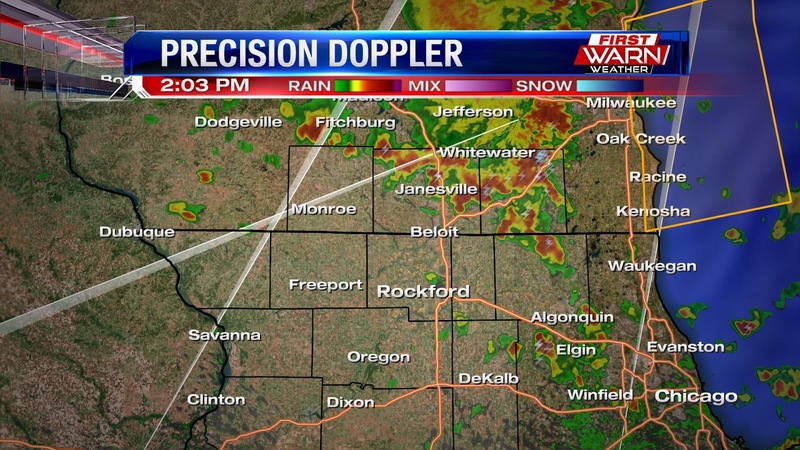 Visibility will drop quickly, storms moving SE at 35mph with wind gusts up to 40mph. 11:25pm Update: Heavy rainfall is becoming more likely over northeast Iowa and southwest Wisconsin. There have been a few stronger thunderstorms over northeast Iowa, but those have since fallen below severe limits. Thunderstorms are expected to move in closer between midnight and 2am. 10:00pm Update: Showers and thunderstorms are beginning to increase in coverage late Thursday evening. The overall severe threat will remain low, however, an isolated strong wind gust can't be ruled out. Of greater threat may be the heavy rain potential. Moisture values in the atmosphere are over one inch. This means thunderstorms will be very efficient at producing heavy rainfall. 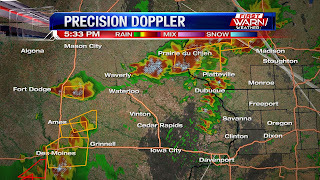 Individual thunderstorms west over Iowa have had a hail and wind threat associated with them, but as they move that will shift to heavy rainfall. An isolated thunderstorm or two is possible through sunset, but the majority of the evening will remain dry. A cold front draped over Wisconsin will begin to sink south Thursday night and early Friday morning, not completely passing northern Illinois until after sunrise Friday. 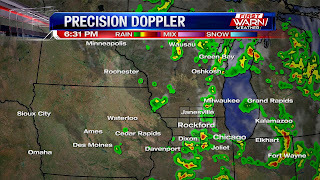 Non-severe showers and thunderstorms have been developing along and ahead of the front in Wisconsin Thursday afternoon. As the front sinks south, our storm threat will gradually increase roughly after 9pm/10pm this evening. Heavy rainfall and gusty winds remain the primary threats, but a hail threat will persist initially with storms that develop to the north. Cold front passes by Friday morning, ending the chance for rain. It'll still feel muggy during the morning, but drier air arrives after 10am and should make Friday afternoon and evening feel much more comfortable. After a brief return to summer like heat and humidity this afternoon, comfortable temperatures will great us this weekend. High temperatures this afternoon will climb to about 90°, but higher humidity will bring the heat index near 95°. This will fuel showers and storms this evening, with a threat for heavy rain and strong winds. There is still a 'slight risk' over the area with storms this evening. Storm threat goes up around sunset tonight with an incoming cold front. High temperatures Friday will be about 10° cooler for the afternoon, compared to today. The cold air will lag a bit behind the front, and we will notice the coolest air arrive this weekend. Along with the temperature drop tomorrow, we will notice a drop in the humidity as well. It will feel much better this weekend high high temperatures about 10° below average. We'll sit in the low 70's through this weekend and into the start of next week. Enjoy! Temperatures over the central Plains and parts of the Midwest warmed into the 90's Wednesday afternoon. A warm front passing Wednesday night will bring a slight chance for showers and thunderstorms, but a significant warm up for Thursday afternoon. Highs Thursday will warm into the upper 80's, possibly low 90's, over northern Illinois and southern Wisconsin. With the warmth, a rise in humidity will also be felt as the heat index reaches the mid 90's for many. Other than a chance for an isolated shower/storm Thursday morning, it looks like most of the afternoon should remain dry - just hot. As a cold front moves down the Midwest from Minnesota and Wisconsin, thunderstorms will quickly develop in the warm and unstable air mass. 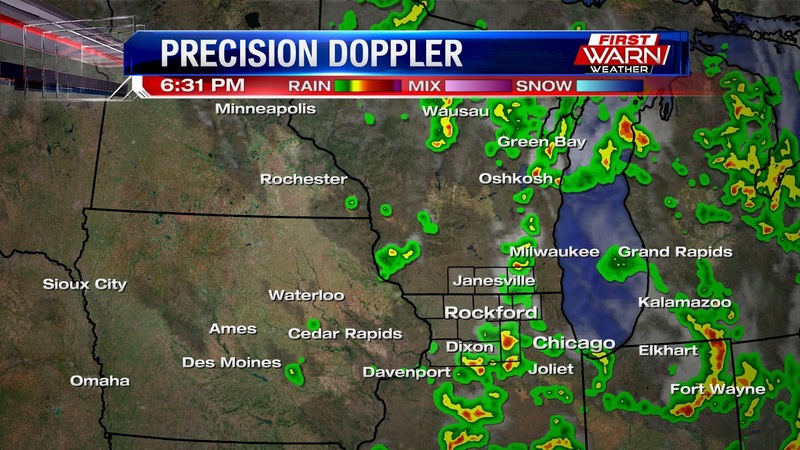 A line of thunderstorms will be possible up north in Wisconsin during the late afternoon and evening. As the front sinks south, a wind threat could develop over southern Wisconsin and northern Illinois by late Thursday evening. The Stateline is under a slight risk for strong to severe thunderstorms late Thursday and Thursday night, primarily for damaging winds. Make sure you stay updated with the forecast Thursday. Heavy rainfall is also likely north over Wisconsin where anywhere from two, to three inches of rain could fall. Currently watching storms that have developed in northwest Iowa march east this morning. The complex is holding together enough, that we will have to watch for a few showers and storms this afternoon. The complex will be on the weakening side of things this afternoon. Temperatures for the first day of summer, will be near average at 82° this afternoon. A higher chance for storms arrives this evening with an incoming warm front. The Storm Prediction Center has highlighted portions of northern Illinois and southern Wisconsin under a slight risk for strong to severe storms. 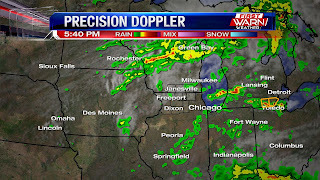 Storms will develop west ahead of the warm front and will head east. 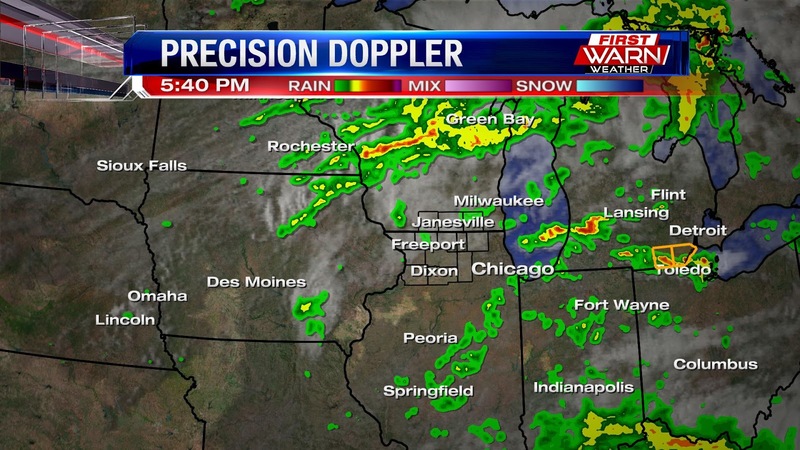 A strong low level jet will develop tonight and will focus the heaviest rain north into southern Wisconsin. afternoon and the rest of the day will end of being dry, but it will be much cooler behind the front. We'll be sitting in the 70's through the weekend. A change in the jet stream pattern brings almost a daily rain threat with it this week. The first came this afternoon, with the second arriving Tuesday. High pressure will build over the southwest causing temperatures to soar well past 100 degrees in many locations from California all the way to west Texas. Excessive Heat Warnings and Heat Advisories have been issued - some of which last all week long! Further north over the center of the country the flow within the jet stream will move more west to east - or what meteorologists call 'zonal' flow. This will keep the extreme heat from making it this far northward, but also allow several upper level disturbances to move through the Midwest and Great Lakes. And as each wave of energy passes through, the threat for rain will increase. Right now it looks like the greatest chance for rain - some of which could be quite heavy - arrives Thursday afternoon into Friday. A cold front will come down from the northwest during the day on Thursday. This front will then stall because the winds within the jet stream will be running parallel to the cold front. 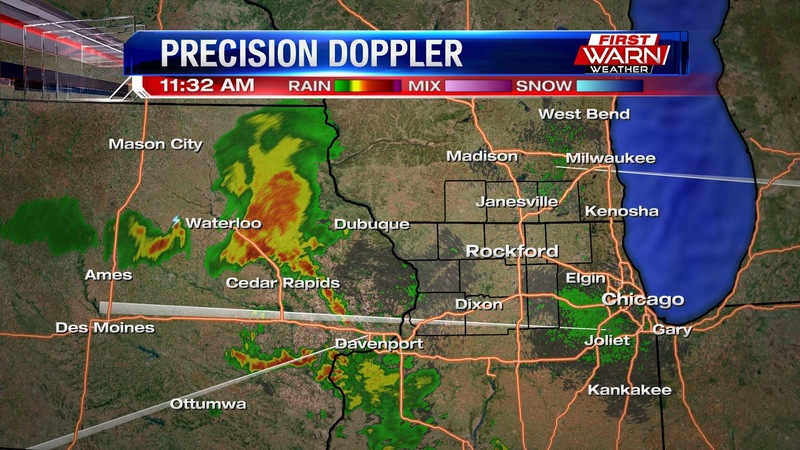 This won't allow the front to move much during this time and could bring heavy rainfall to *parts of the Stateline. Best case scenario would be for the front to shift south Friday morning, taking any of the rainfall with it. A few forecast models do offer up that solution. By the end of the week temperatures are expected to cool into the 70's, with the low 70's expected for the weekend. It does look like June may end slightly cooler than where our average highs should be, which are in the low 80's. A far cry from how the beginning of the month started. Tropical Storm Bret formed off the east coast of Venezuela Monday afternoon, but isn't expected to strengthen much further than its current state. 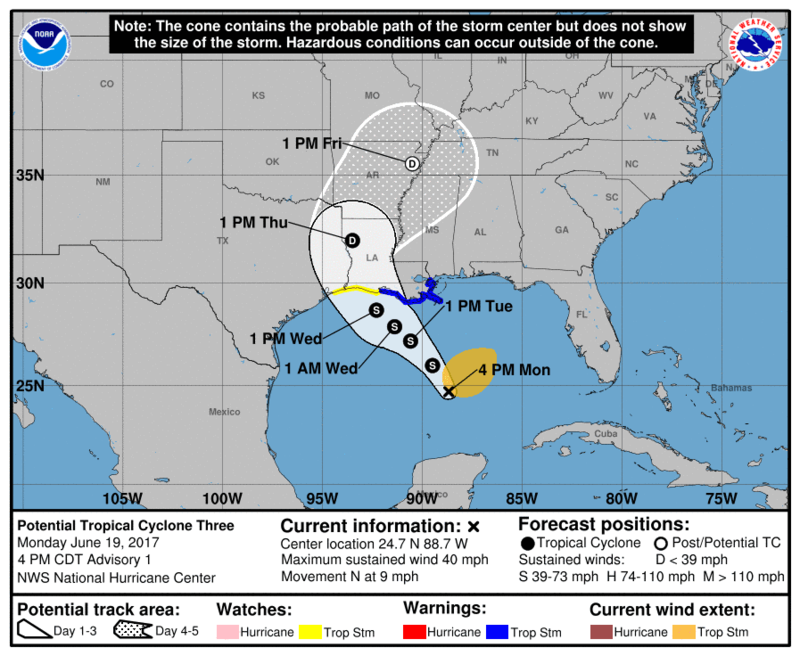 According to the National Hurricane Center, an Air Force WC-130 found a well-defined closed circulation - well west of where it was initially thought. The storm has quickly strengthened, but with its expected landfall near Venezuela and moving into an environment with a little more wind shear, intensification is not expected. This storm is not expected to have an impact on the United States, but will likely bring quite a bit of rain along the coast of Venezuela and Columbia. 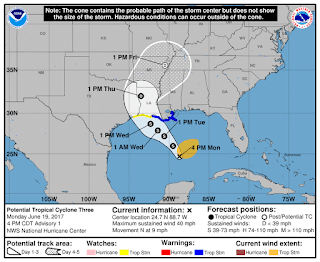 Of greater concern for the United States is Potential Tropical Cyclone 3 forming in the Gulf of Mexico. Galveston, TX to Louisiana. Biggest threat for these areas along the coast will be heavy rainfall. Current rainfall forecasts through Thursday evening have nearly five inches of rain, with isolated rainfall totals nearing ten inches! 6:30pm Update: Radar upstream still showing a few more isolated showers, but looking a little less active. 5:20pm Update: Thunderstorms have become a little more scattered late this afternoon. Brief, heavy downpours will be the biggest threats. Storms will last until a little after sunset this evening, with skies turning partly cloudy overnight. Widely scattered thunderstorms will continue to develop Monday afternoon as an upper level low moves across the Great Lakes. Severe weather is not expected with these storms, however, some may grow just enough to produce a few locally strong wind gusts and hail up to quarter sized. The storm threat will last through sunset. The severe weather threat is low to kick off the work week, but you'll still need to keep an eye to the radar with scattered showers and storms arriving in the mid to late morning, and continuing into the early evening. A few scattered ripples or waves of energy will ride through the northwest flow currently in place in the upper levels of the atmosphere. The ripples will act as a lifting mechanism needed for showers and storms, and the instability needed will come by way of a cold pocket of air. At the 500mb level of the atmosphere, a pocket, or area, of very cold air will arrive overhead from the northern plains. The cold air will bring steeper lapse rates in the atmosphere which will generate some instability. Timing of the waves will be in the mid to late morning, which will bring initial showers and storms this morning and that will continue through the early evening. Some small hail will be possible in these storms, as the freezing line drops closer to the surface with the arrival of the cold pocket. This allows for a better chance for small hail, even though cloud tops won't be very high, they will be tall enough to tap into that chilly air. Once the sun sets this evening, the threat for storms goes down. Another chance for rain and thunder arrives Tuesday. We've had a beautiful day here in the Stateline, and you can't ask for better weather than this on Father's Day, especially after the strong storms that moved through our area last night. We reached the upper 70°s today despite those clouds, but we still got to see a good amount of sunshine. Clouds will decrease as we move through the evening tonight, and we'll hang on to the low 70°s before cooling to the low 60°s during the overnight. Clouds will build back up tomorrow as that low to the northeast will still have a small influence on our area, with a chance for some light rain showers up north. A high pressure system will move in on Tuesday to replace it and bring us more sunshine to go along with those temperatures in the mid 70°s. Storm Threat Ramps up Friday and Saturday.